Kalvakra, The mighty asura is known as the living devil. With his powerful army he mercilessly attacks and defeats the kingdom of Tribhuvan, and later forces its people to work as his slaves. Udho who visits Tribhuvan, with his parents, is also captured by the wicked soldiers of Kalvakra. 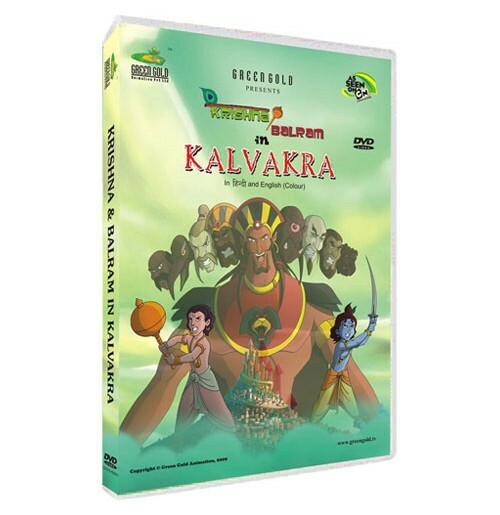 Krishna and Balram, along with Radha take the journey to Kalvakra's island to rescue their dear friend, Udho. The brothers befriend the owner of a boat: with his help they enter Kalvakra's kingdom, disguised as soldiers. When Kalvakra comes to know of the two brothers, he challenges the duo to fight his deadly warriors in a newly built arena. Now , it is up to Krishna and Balram to kill the deadly Kalvakra once and for all. But how are they to kill the one who can only be the cause of his own death? Don't miss the action as Krishna and Balram come to the rescue of their friends once again!